This Sunday, I will run the Sydney marathon in a business suit! I’ll be running to raise funds for the Fragile X Association of Australia, an amazing nonprofit which provides vital support to families with Fragile X syndrome. I’m personally inspired by their work as my son has fragile X and several others in our family are also affected. Being diagnosed with a genetic condition is a huge moment for a family and the association are there to help people in this tough time and beyond. For this run, I’ll be taking on the record for the fastest marathon in a suit. I am the current record holder for the half marathon; now I’m looking to go twice the distance. I’d like to invite you to get behind my crazy challenge and give whatever you can. My Everydayhero page is here. I am aiming to raise $3000 and am half way, after also raising funds and awareness at the City2Surf. The more people that know about Fragile X Association of Australia, the greater their impact, so please also spread the word by sharing my page with your friends and family. What has inspired you to participate in City2Surf? The very first time I did it in 2012 was because of a fundraising promotion for my employer – an aged care NGO, and they were recruiting representatives from all their work locations… so I thought “why not? I’ll give it a go!” I was in the ‘Back of the Pack’ then…. with definitely no running aspirations. I had never even considered running as a viable exercise activity for me. That was until 3 years ago – I was inspired hearing the running journey of a long time distant friend who began in her 30’s and within a few years was running marathons which seemed unfathomable to me. After dabbling in little bits & pieces of jogging/running, getting breathless, walking etc etc, I joined a running club in July 2015 on the recommendation of another friend… not at all considering I could call myself a runner, but again “Why not give it a go!”… Since then I haven’t looked back… 7km runs on Saturday mornings soon became highlight of the week (Whilst I do disclose that the cafe time following does aid the motivation of consistently getting up early on a weekend, there is definitely a ‘feel-good’ adrenaline benefit that makes running so catchy!!). Why are you running with the Fragile X Association team? I want to show my support for wonderful long time friends of mine Helen & Mike Tozer, who have a son who has the fragile X syndrome. With my background of midwifery I was a support person for Helen & Mike at the time of Josiah’s birth in 2011 in Hong Kong (at the time we were all full time volunteers, working together with another charity based in HK). Thus I have known Josiah since Day 1 and would love to support this family as they continue to raise him to achieve his fullest potential. Are you honouring someone in this year’s run? Can you talk us through your fundraising efforts so far for this year’s race. Anything else you have planned? I’ve sent an email to some friends and I do plan to pass on the info to some of my Saturday am running club companions. What are your goals for the 2017 City2Surf? Run the course in less than 1hr & 50mins. What challenges have you set yourself? I’ll do a post or 2 on facebook this week… especially as a way of linking this fundraiser to those in the running club I’m also part of. I’m not much of a ‘facebooker’ so I consider this a challenge enough for this week!! Longer term running challenge: do 12-14km runs on at-least a monthly basis between now and August 2018. We’ve just reached 10 people (or ‘angels’ as we like to call them!) in our Fragile X Team which is pretty exciting! We sat down with Maria, one of the team, to ask her a few questions about her run. She’s a star! What has inspired you to participate in City2Surf? I was challeged to complete a triathlon with a friend earlier this year as it was on her bucket list to do. Surprisingly I did it, and it was fun, and on finishing it, my friend said ‘what’s next? Let’s do the City to Surf’. Her husband, Mike was forming a team to run the City to Surf to raise money and awareness for the Fragile X Association of Australia, so I agreed to join the team. Why are you running with the Fragile X Association team? I know Josiah Tozer and his family who are affected by Fragile X, and am so happy to be able to support them all, including doing the City to Surf for the first time. I am keen to support the foundation to raise awareness, and help to support others affected by Fragile X. Are you honouring someone in this year’s run? Yes, Josiah Tozer and his amazing family. Can you talk us through your fundraising efforts so far for this year’s race. Anything else you have planned? I have shared my details for fundraising on Facebook and instagram, and will continue to send reminders in the weeks to come in the lead up to the race. What are your goals for the 2017 City2Surf? What challenges have you set yourself? To complete the race, and have fun doing it. I am not a huge running fan (I prefer to swim! ), but am keen to take on the challenge and comple it well, even if it is as a gently jog! I watched Mike complete a half marathon (and get into the Guiness Book of Records! ), and loved watching all the people completing the race, and was inspired that anyone could have a go- even me! So, if I can do it, hopefully I can encourage others to challenge themselves to complete something that seems impossible to them, but they really are keen to do, too. Very excited to be playing a part in raising awareness about fragile X syndrome this weekend with fragile X awareness day. I was involved in recording a series of videos for doctors and the one featuring me has just gone live. Seeing it brings back all the memories of the recording! It took a few takes as the first one I did off the cuff with just a few notes in front of me. But I made one mistake and had to re-record. Then I struggled to re-create all that went well for the first take as well as correct the mistake! I got there in the end. I hope this will help along with all else that is happening for Fragile X this weekend – events, buildings lighting up, social media posts – to share this important condition with a lot more people. If you’d like to take some action after hearing of fragile X then please head over to my City2Surf fundraising page. I need to raise $100 each day between now and August 13th to hit my goal of $3000. Yesterday was a real day of contrasts. From the highs of winning a race and speaking about fragile X, to the lows of not sharing it with my family, back up to the highs of having a photo shoot that worked perfectly for our son’s special needs. The day started at the Festival of the Feet in Georges Hall. 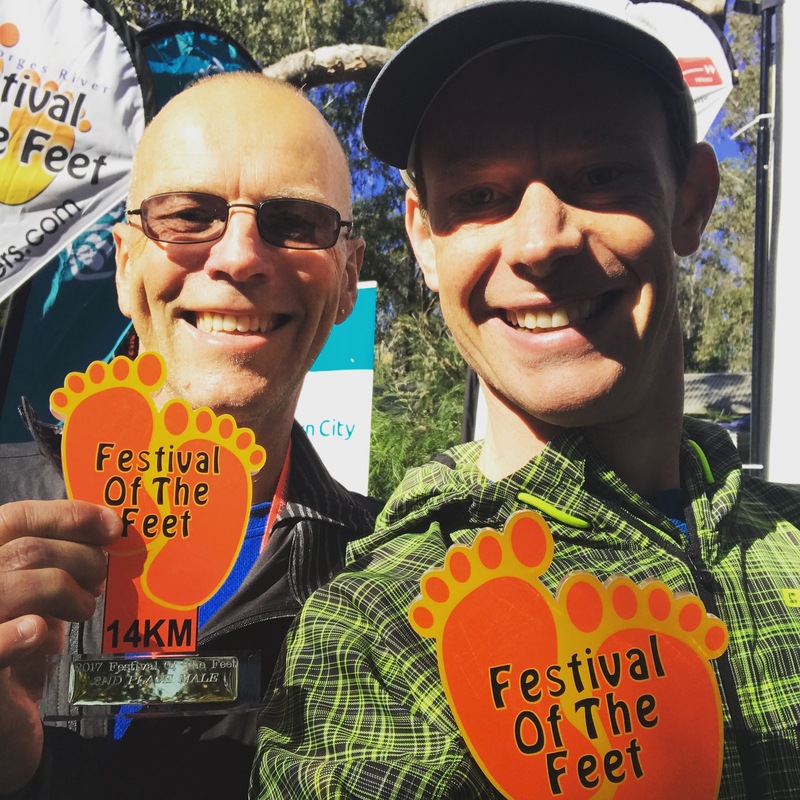 I entered the 14km and was pushed all the way by David Riches. At almost twice my age I hope I’m running as fast as he is in my 60s! I finished first in 51:21. A friend and former colleague did a great job MC’ing the event. At one point she got all the kids to run forward if their parents had the smelliest running shoes. I’m pretty certain I would have won that prize if my kids had been there! Sadly attending such events is close to impossible with our kids. We can just about do it with intense planning and backup from grandparents or a friend. But it is really stressful. It’s certainly not the fault of the race organisers. If anything this was one of the most accessible events, with parking close by, speakers not too loud and ramps instead of steps. But for Josiah, what are typical noise levels for most people can be like a war zone for him. The bombardment of sounds, light, people and sensory input just gets too much and he runs off banging his head in frustration. I had a few minutes on the stage to share about fragile X. I mentioned my son and that it was fragile X awareness month. I shared about my upcoming fundraiser at the city to surf when I’ll be running in a suit. (Link here if you want to get behind me!). It was a privilege to have a few moments to raise awareness among the runners and their families. In the afternoon we were visited by a photographer and his wife who came to take photos of our family. We know them through the Fragile X Association and they were very understanding of Josiah’s fragile X symptoms. They spent time making Josiah feel comfortable with them and came to our home so he would be relaxed. It really worked! We had photos with him and his sister, with our family of 4 and also with his grandparents. Josiah was so chilled out we even had time for some shots of just Helen and I! 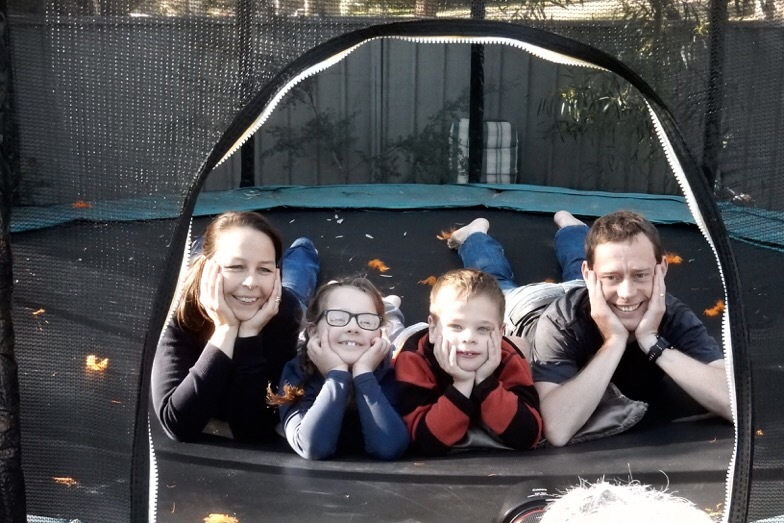 Even though some experiences are challenging or close to impossible for us, fragile X has also enabled us to have some amazing experiences as a family. Just as some doors have shut, others have opened and we have met some amazing people through the association. At the end of the afternoon, the kids happily played while the adults sat down at our kitchen table. All 6 could point to specific ways they had been impacted by the work of the Fragile X Association. Whether attending a seminar, meeting others who are affected or interacting with the handful of tireless staff in the office, everyone had a story to tell of how they had been touched by its work. If you’d like to support the work of the Association or are inspired by my crazy running antics please consider giving $20, $50 or whatever you can to my fundraiser. World Record attempt and City2Surf run! I am currently training for two events in August and September 2017. Both of these I will run in a business suit. Yep. That’s right. Sounds a little crazy, but it’s for a fantastic cause. I’ll be running to raise funds for the Fragile X Association of Australia, an amazing nonprofit which provides vital support to families with Fragile X syndrome. I’m personally inspired by their work as my son has fragile X and several others in our family are also affected. Being diagnosed with a genetic condition is a huge moment for a family and the association are there to help people in this tough time and beyond. They are a small, nimble nonprofit with a staff of 3 but have a huge impact. My first run is the City2Surf in Sydney. I’m aiming to be the first costumed runner over the line. Apparently, superman is going to give me a good run for my money. Perhaps I’ll look like Clark Kent when racing him! The second run, just a few weeks later, will be a world record attempt. I’ll be taking on the record for the fastest marathon in a suit at the Blackmores Sydney marathon. I am the current record holder for the half marathon; now I’m looking to double that. This means double the distance but far more than double the effort with the hot sweaty suit – a 3 piece suit to be precise – weighing me down. I’d like to invite you to get behind my crazy challenge and give whatever you can. My Everydayhero page is here. I am aiming to raise $3000 and have a long way to go. Thank you in advance for your generosity, it means a lot! We have an awesome team of people running in Team Fragile X at the City2Surf please get behind them too – or consider running with us – it’s not too late to signup! I’ve had the Brooks Asteria for a couple of months now. I’ve been really impressed by them so thought I’d post a review here. For my own situation I’m seeing these shoes as a marathon racing shoe that will replace my Brooks ST Racers. The ST did a great job at carrying me through the Blackmores Sydney marathon this year and now I’m looking ahead to my marathons in 2017. The Asteria is the new upgrade. So far I’ve done a few speed workouts in the Asteria as well as a few mid-paced long runs and they have held up really well. Compared with a much lighter racing flat like the Brooks T7 racer, there is quite a bit more support in these shoes. Just enough to keep me supported in the tired end of a marathon. Yet compared with a heavier support shoe, they are light enough that they don’t add much to the weight of your tires legs. I did a comparison of the Asteria against the T7, the ST racer and the GTS. Of course, there are always official weights of shoes but I find there is sometimes inconsistency across which sizes are used. So I prefer to weigh them myself. I’m a size 8, so that’s what I used for all 4 of these shoes. The Asteria came out at 230g per shoe as comparable to the ST (215g), but slightly heavier. This surprised me because the Asteria feels and looks narrower with less material. I can only assume that the material used (perhaps due to the BioMoGo – see below) is slightly denser. As another comparison, all the rest of my race kit weighs about 150g in total, so the shoes is a significant factor. Having said that even the GTS at 280g is less than 1% percent of my body weight for both shoes. But that still feels like it is adding a chunk to the weight of each leg at the 40km point in a marathon. The fourth shoe I weighed was the T7 at a mean 160g. Very light but not enough protection for me for a longer race (half marathon+). The toe box on the Asteria feels slightly narrower than the ST racer. I prefer this as I like a good fit, but others may find it too narrow. The Asteria feels quite similar in fit to that of the T7 racer. It’s not super snug but I wouldn’t describe it as a wide fit. One big update for the Asteria over the ST (and also the Hyperion over the T7) is that the sole has the Brooks BioMoGo material. This material is soft under low impact and hard under big impact. So, it feels softer on a long run and racing-tough -but not too tough – on a fast workout. I have had some problems with the T7 shoe leaving my toes in a bad way after a half marathon with the constant pavement pounding. I’ve done one race – a 5km – in the Asteria and felt a big difference on the downhills with my feet feeling much less under stress. One thing I am conscious of are seams in a shoe as potential blister hot spots. The upper of the Asteria does well on this point. It is comfortable, smooth and seamless – a step up from the ST racer. I used the Asteria last week at the local parkrun to give them a good run out. They fared really well – in fact, they almost snatched me the course record! It was only a 5km event but I still felt that they gave a good balance between feeling fast and cushioning my feet, which is just what I am looking for in a marathon shoe. I’m pretty happy with the Asteria. A well designed shoe with some great updates on the ST racer. I’m pleased to say I’ve found my shoe of choice for the Sydney and Canberra marathons in 2017! Some days training is just tough. It’s hard to get going, hard to keep at it and hard to just get it done. Today was one of those days. I had to motivate myself to get going by committing to post my workout online. So here it is. 4 sets of 2km at 6:46/2km. Rather than the goal of 6:46 per set I was about 10-20 seconds off the pace. 6:55, 7:07, 7:00 and 6:57 were my 2km splits. I blame the gap on a general feeling of fatigue I’ve been experiencing since my first marathon in September, a more short term fatigue following an eight year old’s birthday party yesterday(!) and a pair of hills in my 2km road circuit. In fact, it’s amazing I was only a few seconds slow! To do the run I wanted a new route and I found a really nice fairly flat (apart from those 2 hills) 2km loop around Mt Colah. Some beautiful purple flowers were blossoming on many of the trees which also provided some shade from the hot sun. On my second lap I passed a guy walking with an ankle in a cast and instantly felt grateful that I could run despite how tough training felt today. This was the first fast workout I’ve done in my new Brooks Asteria racing shoes. Felt nice and light, very similar to the ST racer. Will do a proper review later after I’ve done a few more runs in them. Earlier this year I had the amazing opportunity of taking on and then breaking a world record. As I reflect back, one of the things that most stood out from the attempt was the tiny margin at the end: just 2.8 seconds. The whole race took a total of 78’10” or 4690 seconds, so 2.8 seconds is less than 1 in 1000. As a comparison it is closer than Usain bolt winning in 9.81 over second place in 9.82. In fact, over a 10 second race the proportional gap would be 0.006 seconds! I keep thinking what things could have slowed me by 2.8 seconds. What if I hadn’t had my team taking photos and instead had to take selfies, as with my prior attempt? Of if the weather was a couple of degrees warmer….. But it almost was a few seconds the other way. As those who were following along the day know, straight after the race I thought I hadn’t done it. It was such an emotional roller coaster! Track back with me to the moment I entered the stadium for the last few 100 meters. I’m super hot, drenched in sweat and wearing this 3 piece suit. I hit the track with 60 seconds to go. I thought I had it. I did some quick mental maths. Or I tried to. I thought, I can run a lap in under 80 seconds. And as we entered in the back half of the track we had less than 400m to go. But here is where in the heat of the moment I made a slight miscalculation. I thought: we are at the back half of track so that means I have 200m, which I can do in 40 seconds giving me a 20 second cushion. Yet in reality it wasn’t 200m – in fact, we entered the track nearer to the 300m mark. Above is my confused face as I’m realising this. I threw everything into that sprint, hitting a pace that my favourite Hong Kong track at Aberdeen stadium has never seen from me. 2:40/km at the end. As I ducked over the line I caught a glimpse of the clock turning from 13 to 14 seconds. I thought I’d missed out by one second. Then the announcer called out a time a few seconds later as 1:18:18. He sounded so confident I thought that was it. My wife, Helen and I recorded a facebook live video to say I hadn’t made it. But the fact that I was so sure I was on time coming into the stadium, and that the clock looked closer to 13 or 14 seconds as I hit the line gave me a glimmer of hope. So I went over to talk to the timekeeper. He pulled up the official logs…. 1:18:10! I almost knocked over the TV in my excitement in rushing over to hug Helen!! On my wife’s phone is a video of the start line and in that I can see that the marathon clock started at 30:04 before our race. And it was this clock that I was looking at as I sprinted down the final straight. So what looked like 14 seconds was in fact 10 seconds. After seeing that video it all makes sense. I’m still not sure why the announcer called 18 seconds. He later retracted this and admitted a mistake. I think he must also have been looking at the marathon clock and perhaps glanced at it a few seconds after I crossed the line. But the timekeeper looked at the data and announced 1:18:10. So I learnt to never give up in til the very last second. And even if you think you’ve failed you could be looking at the wrong clock!